Yes, it’s been a while. But we have a good reason, which we explain to you in the first few minutes of the show. 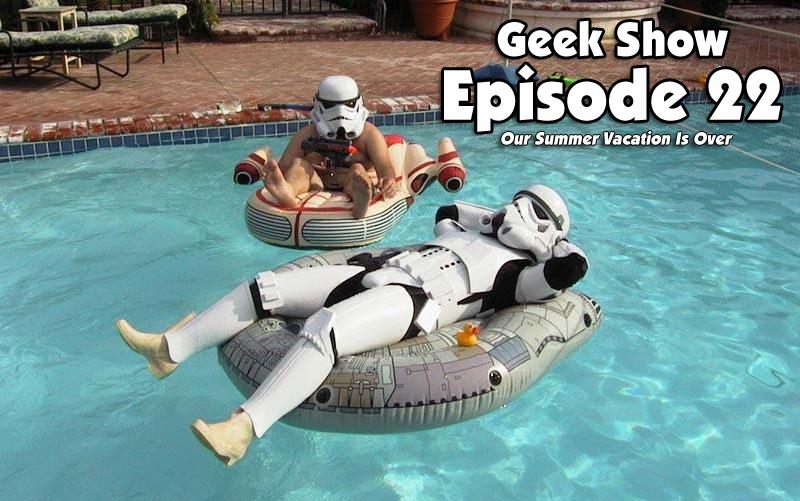 But hey, we’re back and we’re still talking geek stuff! Want a quick rundown? OK.
Now please note, the recording date of this show was BEFORE San Diego ComicCon started. So we started with some casting and movie news from the Marvel world. We talked some Spider-Man, Daredevil season 2 casting, Punisher, Jessica Jones and a bunch more. Not much for the DC end of things, but hindsight is now 20/20 and you know, we’ll have a ton to talk about next episode. We also talked a little Star Wars too. Mostly about Vader, the beginning of filming of the new anthology film, Rogue 1, the Han Solo anthology film. Gotta say, Disney is not playing games with Star Wars! I also took a moment to fanboi a little for an old game I used to play, and it’s recent resurgence with it’s old community, City of Heroes. There has been an unofficial update to the now cancelled game, but if you were a fan, like myself, then you’re in heaven knowing you can get back on and mingle with some old friends and make new ones. That’s it for this episode, but we’re already working on Episode 23 and there will be a lot to it. So till next week, #StayGeeky! Posted on July 14, 2015, in Geek Show and tagged comic con, Daredevil, Darth Vader, Jessica Jones, Marvel Comics, netflix, Star Wars. Bookmark the permalink. Leave a comment.